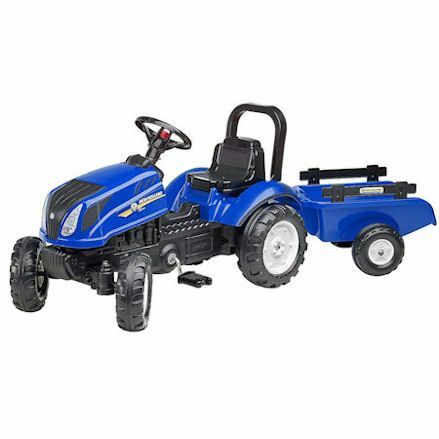 What better way to shop for New Holland ride on pedal tractors than viewing them all from a single page, rather than searching the whole internet for all your options. And well there our many popular licensed ride on tractors to select from, New Holland are up their with John Deere as among the most popular with kids. 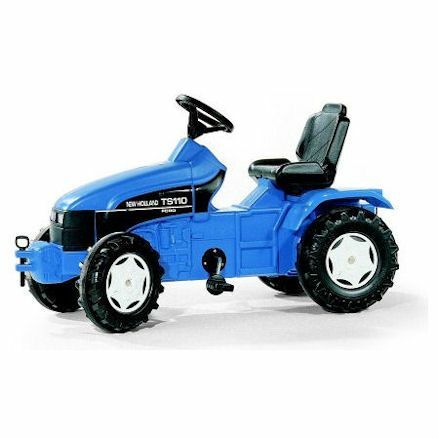 You'll be sure to not go unnoticed riding one of these stunning blue New Holland ride on toys. Before you browse our top 10 list below, be sure to visit our guide to ride on tractors page, which guides you through buying your first ride on tractor, outlining all features. 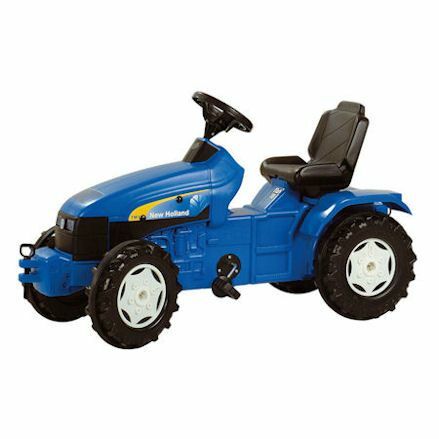 You may also be interested in visiting our New Holland farm toy range. 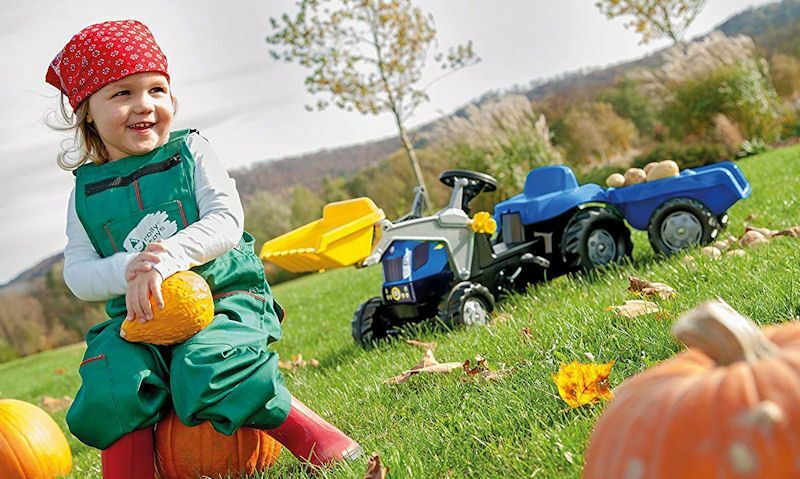 Well Rolly toys dominate our featured list, you'll also find a Falk pedal tractor too. 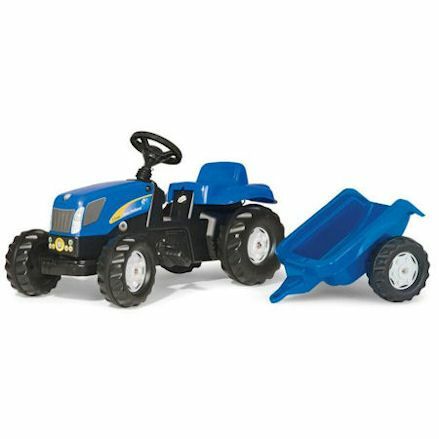 First up on our list is this Falk New Holland ride-on tractor with a matching blue detachable trailer attached to the tractor rear hitch. Features pedals with grips and a horn on the steering wheel. Ages 2 and up, Measures: 132 x 42 x 53 cm. This Rolly ride on tractor is similar to the one above, but heavier and bigger for 5 years and up. Not only does it have a matching detachable trailer but a functioning manual font loader with tipping action and opening bonnet. 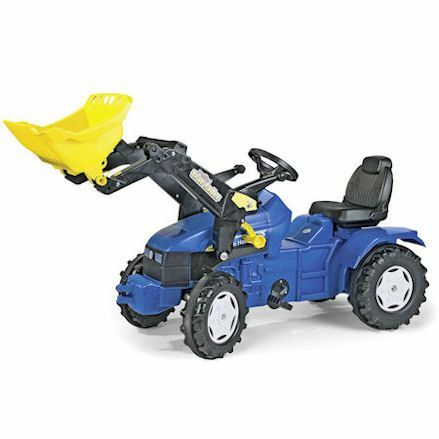 This extra large New Holland chain driven ride-on tractor has an adjustable seat with back rest, anti-slip pedals, large rugged wheels and front and rear hitch pins, for ages 3 years and up. Measures: 112 x 51 x 60 cm. 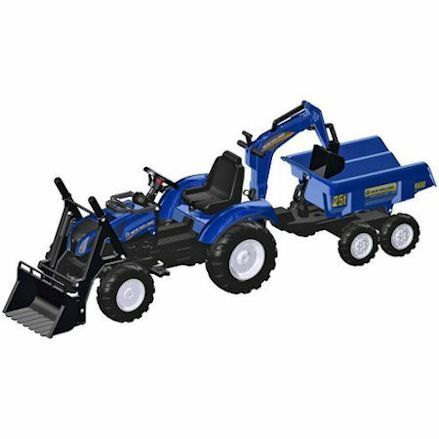 Similar to the model above, this tractor has a working front loader, adjustable seat, covered integral chain drive with adjustable pedal crank, extra strong 12 mm steel rear axle, front suspension with Ackermann steering, and rugged pedals. 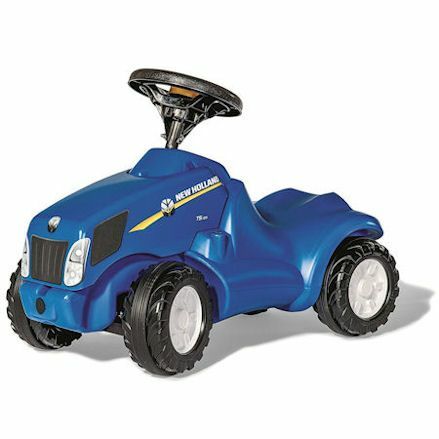 Targeted toward ages 1.5 to 4 years, this mini foot to floor ride on tractor features an opening bonnet, a steering wheel with an integral squeaky horn and a knee indentation to scoot along - no peddles, no problem - always standing on feet. 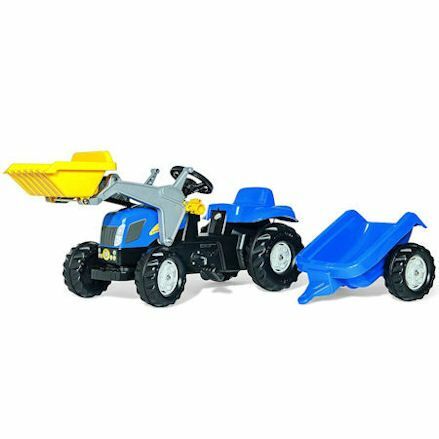 This cool tractor has a rear hitch pin, a bonnet that opens and an all important trailer for hauling bits and pieces in the garden or park. 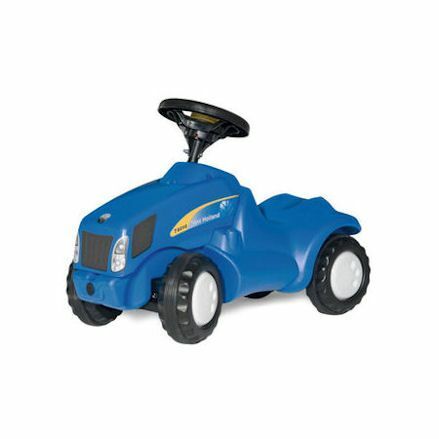 Built with child-friendly anti-slip pedals and large, rugged style wheels - lots of fun and plenty of exercise. Leg powered ride on mini trac which moves forward as the little driver scoops there feet along the ground - ideal for ages 1.5 to 4 years. Features an opening bonnet, a steering wheel with an integral squeaky horn, and enough leg room away from the wheels. Beast of a machine Rolly New Holland 'Xtra' tractor with functioning front loader with tipping bucket controlled by hand. Its built with a large chunky tread wheels, rugged pedals and a distinctive back support. For ages 3 years and up. Actually similar to the model at number 3 on our list above, only this one is an upgrade and the latest available. 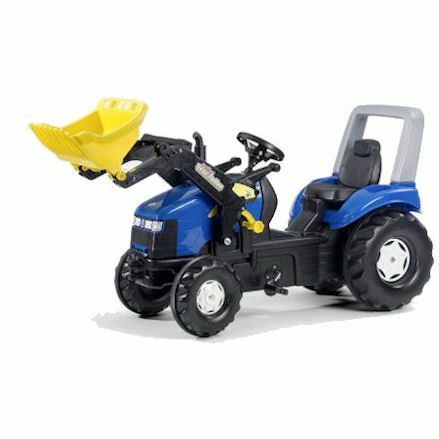 Comes with front and rear pins, rugged pedals, large chunky wheels, engine detail, steering wheel and of course bares the New Holland branding. What a monster, and just by looking at the picture you know your little tractor driver will want this one. This pedal ride on tractor has a fully operational articulated backhoe, rotating seat, front loader and twin axle giant dumper trailer. Age 3 years and up.